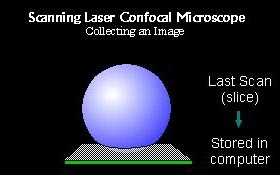 Hypothetical specimen under a confocal microscope. 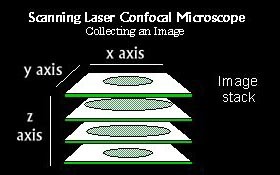 The initial scan collects an optical slice of the image and then stores that image in the computer. The stage is moved in the Z direction and another optical section is taken. The digital image is again stored in the computer. 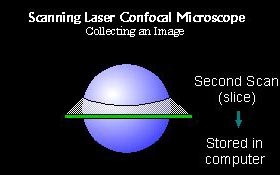 Each optical slice taken is within the acceptable range of depth-of-focus. This means each slice appears sharp to the eye. 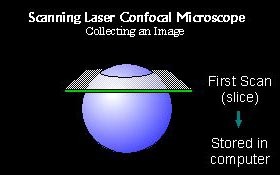 The final optical slice is scanned and stored in the computer. Once all the slices are stored in the computer an image stack can be created. The number of slices in a stack can be from 1 to 200. 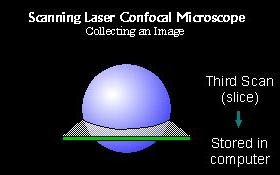 From the image stack an image is produced called a projection. For thicker specimens, more sections provide greater Z-resolution. This image is a projected from the top and is called an XY projection. 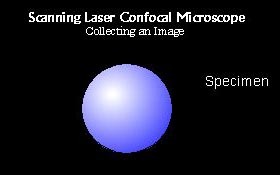 Notice in our hypothetical scan that the projection color is not the same as the image color. This is due to two factors. The actual colors of an image are assigned in the computer and can be set to any color. We call this pseudo (false) color. 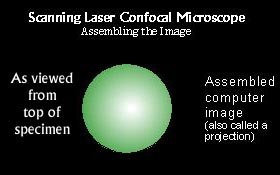 In general, images are set to resemble the actual color that would be result from a typical excitation/emission image. Below is a collection of individual slices called a mosaic. 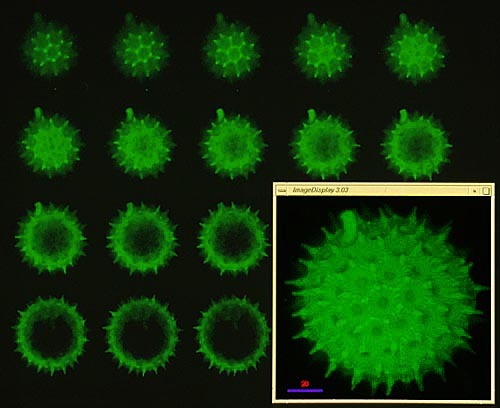 The series of slices were taken of a pollen grain. Each slice shows only a portion of the entire sample. The lower right image is a projection image made from the series.